Make your Most Important Leads Stand Out · You Don't Need a CRM! Every sale is different, but some are known as “hot” and stand out from the rest. You'll have your own type (whether it's value, time required to complete, etc) that you want to treat differently. Consequently, you need them to stand out from the other dozens you are managing at that very moment. 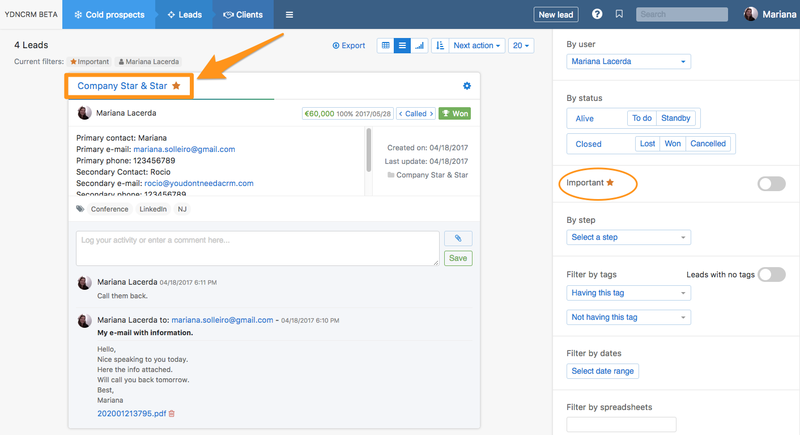 Inside no crm.io you can easily do that by starring a lead. All the "hot" leads will then move to a special menu, and when in your 'To-Do' or 'Activity' feed they will stand out thanks to the orange star. Make sure that you don't only manage the starred leads. Remember the 'To-Do' feed is also important!